Add a shot of color to your spring wardrobe. When it comes to print tote bags, floral versions are no longer the garden variety selections of the past. Today, these carryalls are designed with the modern, fashionable woman in mind. Tote Bags: Functional and Fun! A tote bag is a must-have item for any woman. Not only is it one of the most useful types of bags available, it's also available in a variety of styles to suit every personality and color preference. Each season brings with it a new crop of tote bags, and while they might be trendy, the majority of them also promise to stand the test of time. In addition to being stylish, they're also handy! Tote bags are perfect to carry to the office, great when you're out running errands the entire day, ideal when you're out with the kids and need a little extra space for their essentials as well as your own…you get the picture. There's almost nothing a tote can't handle! Of course, you need to make sure your tote is equipped to handle your burden. If you tend to be a naturally light packer, then a lightweight fabric tote shouldn't be a problem. If, on the other hand, you're an everything-but-the-kitchen-sink type of person, you may be better off with a tote that's made of a more substantial, hardy material (like leather or thick canvas). Spring 2008 promises to be one of the most memorable fashion seasons ever! Bright color, feminine florals, intricate patterns and delicate fabrics dominate everything from clothes and accessories to shoes and even cosmetics. If you're hunting for the perfect tote for the season, consider something with a vivid burst of fresh flowers. 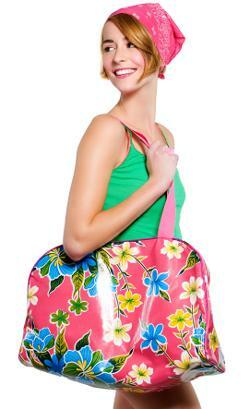 Floral bags are inherently charming, but they can also be fuddy-duddy and matronly at times. You'll know what's right for you when you see it - just keep an eye out for your favorite colors. Nothing could be more fresh or springtime-appropriate than a print tote bag, floral style. Totally cheerful thanks to their upbeat color palettes, these totes will easily see you through the season and well into summer. With the selection available right now, you might find yourself ogling more than a few! The good news? Many of them are reasonably priced, so you can indulge in a few without any guilt. With that in mind, take a peek at a few of these finds. The utmost in glamour can be found in some of the world's most high-end designers. This take on the floral tote by Stella McCartney is like a walk through a vibrant field full of your favorite flowers. Take in the blues, yellows and reds and you might actually feel like you've been transported to a calmer, more beautiful place! This canvas tote is coated to add greater protection, so consider it a great choice for everyday use. It's priced at $1,095. On the other side of the price spectrum is this sweet tote by Forever 21. You can't go wrong with a bright, cheerful floral shopper, and the teal and navy color scheme is flawless. Best of all, it's available for just $14.80. How's that for a steal? Strong in design and construction, this floral-print tote from Banana Republic is smart and pulled-together in a way that few floral totes really are. Thanks to its extra-sturdy canvas material and thick rope handles, it easily manages heavy loads and keeps you looking stylish - even if your shoulder does feel like falling off. Available in shades of lava and aqua, this tote is $138. Coach can always be counted on to provide something that's inherently classic. You can't go wrong with a basic black pebble leather bag, and this Nolita satchel features a tasteful red floral print to dress it up a bit. The bag has handles, but it also comes with a detachable strap if you care to use that instead. Great for a die-hard Coach fan, this tote is $350. Get set for that trip to the beach you've been daydreaming about since November! This adorable Tommy Hilfiger Regatta tote is a playful bag with an eye-catching, red and white graphic print. Short straps give it a more handbag-like feel, and its less spacious interior makes it appropriate for just a few basic essentials. Made of canvas, it's also available in black and yellow colors and runs $59.